The Take That star's last solo track Candy shot straight to the top of the UK charts. 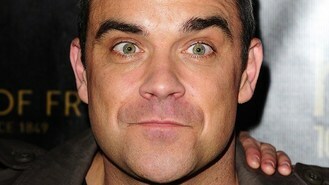 But Robbie, 38, told TV Times he'd been bruised by the reception to some of his previous efforts. "I need a second opinion, and a third, and a fourth, and a fifth," he said. "Especially since I've been so excited about other stuff in the past and then sometimes it's not been a hit with the audience. "Anybody passing my house gets dragged in and I'll say, 'Sit down and listen to these four songs'. "The dustbin man and the gardener sit in the studio looking confused, going, 'yes it's brilliant, Mr Williams'." Robbie admitted: "I drag everybody up there - it's really sad, ageing pop star stuff!"